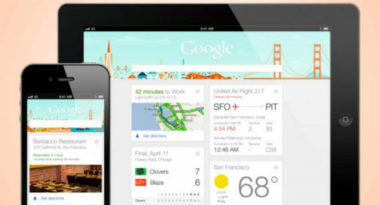 Google has announced that Google Now will be available to iPhone and iPad users. Google Now is the search giant’s smart search service that acts that like a personal assistant to provide users with the right information at the right time. Android users were the first to have access to Google Now, and the service is now expanding to iOS users through an update to Google’s Search app, which is available at the App Store. Readwrite.com reported on the specifics behind this search service extension. The iOS version of Google Now will be slightly different from the search service enjoyed by Android users because it won’t be as fully integrated into the mobile platform. iOS users will have the same general search capabilities and access to information from Google’s huge web of services, but they won’t have a swipe gesture for direct access, a homescreen symbol, or as many “cards” for conveniences like events and boarding passes. These “cards” serve as the delivery system for the desired search content and are completely based on the context of the user’s search. Even with fewer cards and extras, Google expects that Google Now will be embraced by iOS users seeking the ease and instant access of the smart search service. Many have compared Google Now to Apple’s Siri, since both serve as virtual personal assistants to help users access information relevant to their specific search needs. While there are advantages and arguments for each, iOS users will now have the choice of which smart search service is the smart one for them. To learn more about the power of Google Now’s smart search service, contact MDG Advertising today at 561-338-7797 or visit mdgadvertising.com. MDG Advertising, a full-service advertising agency with offices in Boca Raton and New York, NY, is one of Florida’s top integrated marketing agencies. Our 360° approach uses just the right mix of traditional and digital marketing to reach your advertising goals. While some industries may fare better in print and others online, we strive to create a balanced approach, where traditional, digital, social, and search marketing efforts support each other and your message is tailored to the medium. To stay on top of the latest trends in search marketing, contact MDG Advertising today at 561-338-7797 or visit mdgadvertising.com.